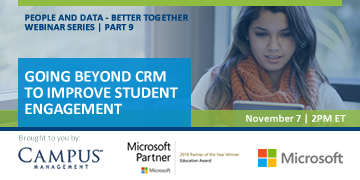 Join Dr. Jennifer Beyer, Campus Management’s Vice President of Product Management for a deep dive on a new engagement platform built on Microsoft Dynamics and Azure Cloud: CampusNexus® Engage. Dr. Jennifer Beyer leads the strategic direction and execution of the Campus Management CRM portfolio, including CampusNexus CRM, CampusNexus Engage, Radius by Campus Management, and the ApplyYourself, AppReview, Connect, and Retain product lines. Prior to joining Campus Management, she was General Manager for Admissions Solutions at Hobsons, Inc., where she led the development of these solutions to help institutions meet enrollment goals, improve student success, and implement retention interventions. Dr. Beyer graduated from Nova Southeastern University with an EdD in Higher Education Administration. While there, her research focused on student retention, particularly in a community college setting.